There is some chance this may be apocryphal (I don't see any evidence the reporters confirmed this with the FDA), but as someone who has had government inspectors show up on our property demanding to see our license to sell eggs, it wouldn't surprise me if true. I am bombarded with government insanity of this genre every day. My USDA rabbit license requirement has taken another ridiculous twist. I just received an 8 page letter from the USDA, telling me that by July 29 I need to have in place a written disaster plan, detailing all the steps I would take to help get my rabbit through a disaster, such as a tornado, fire, flood, etc. They not only want to know how I will protect my rabbit during a disaster, but also what I will do after the disaster, to make sure my rabbit gets cared for properly. I am not kidding–before the end of July I need to have this written rabbit disaster plan in place, or I am breaking the law. The bizarre government requests like this one at least give us a laugh around here. Less funny are the zillions of other pieces of waste paper that must be supplied to various agencies every month -- for example the 9 different permits which took 3 years to accumulate from Ventura County just to remove a dangerous and rotting deck (not coincidentally, we are closing all our business in Ventura County at the end of this year). Just in the last several days the Department of Labor asked for new, more onerous monthly reporting of headcounts and payroll by state (I declined) and the census bureau asked for quarterly rather than annual detailed reports of our lodging business (I declined). One piece of advice I would give to harried small business people is to say "no" as often as possible to these data requests. Obviously, you will need to turn in your monthly sales tax reports or you will be going to jail, but do you really need to feed the census? The department of Commerce? The Department of Agriculture? The Labor Department? Much of this data they gather is used either 1) to craft regulations that will just make your life as a business owner harder in the future or 2) to subsidize academics and economists in the form of free data. As I told the Labor Department the other day, I am happy to fill out their survey if they want to pay me, say, $100 a month to compensate me for my time. Otherwise they are just stealing free labor and proprietary data from me to help some grad student write her PHD or help some Wall Street hedge fund manager better call the market. I am simply amazed at this level of cronyism enjoyed by the sugar industry -- import restrictions on cheaper world sugar, price supports, and government loans that can be paid back with excess product rather than cash. The U.S. Department of Agriculture is likely to buy sugar in the domestic market this year in order to drive prices up and prevent defaults on loans made to sugar processors, according to a USDA economist. The USDA estimates it would need to buy 400,000 tons of sugar to boost prices to an “acceptable level,” said Barbara Fecso, an economist at the department. A purchase of 400,000 tons would amount to about 4.4% of projected U.S. sugar production in the marketing year that ends Sept. 30. Domestic sugar prices have been trading at about 20 cents a pound, their lowest level in nearly four years, putting companies that make sugar from cane or beets at risk of defaulting on loans they received from the USDA when prices were higher. People talk about these supposed government subsidies for oil companies, but every time I see a list of them they are dominated by things like depletion allowances, FIFO accounting, and investment tax credits, which are either standard accounting rules that apply to all industries or tax credits that apply to all manufacturers. But Big Sugar gets real heavy-duty subsidies no one, except maybe ethanol companies and other farmers, get. In this case, the USDA imposed on the [raisin farming] Hornes a “marketing order” demanding that they turn over 47% of their crop without compensation. The order—a much-criticized New Deal relic—forces raisin “handlers” to reserve a certain percentage of their crop “for the account” of the government-backed Raisin Administrative Committee, enabling the government to control the supply and price of raisins on the market. The RAC then either sells the raisins or simply gives them away to noncompetitive markets—such as federal agencies, charities, and foreign governments—with the proceeds going toward the RAC’s administration costs. I have seen estimates that a Medieval serf had to pay between 30 and 70 percent of his crop to his master. The RAC seems to be right in line with these numbers. "As anticipated, lower projected production for both corn and soybeans was reported this month," said AFBF economist Todd Davis. "It will be some time before the long-term effects of the 2012 drought are fully played out. But it appears likely that continued strong worldwide demand for corn and soybeans will lead to higher projected prices." 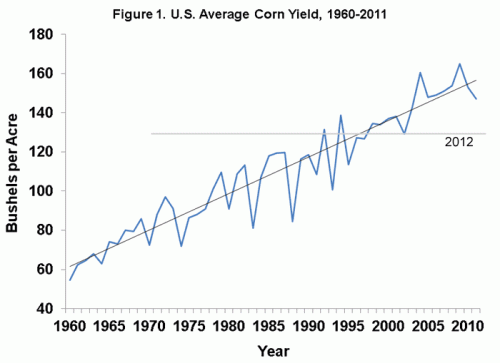 USDA forecast corn production at 10.7 billion bushels. The average yield for corn was forecast at 122.8 bushels per acre this year, down slightly from the August prediction. Once harvest is complete, if the average corn yield comes in at 122.8 bushels per acre, it would be the smallest average yield since 2003. So, down 15-20% from the last several years, which is not good, but a number that still would be nearly an all-time high until about 2000. 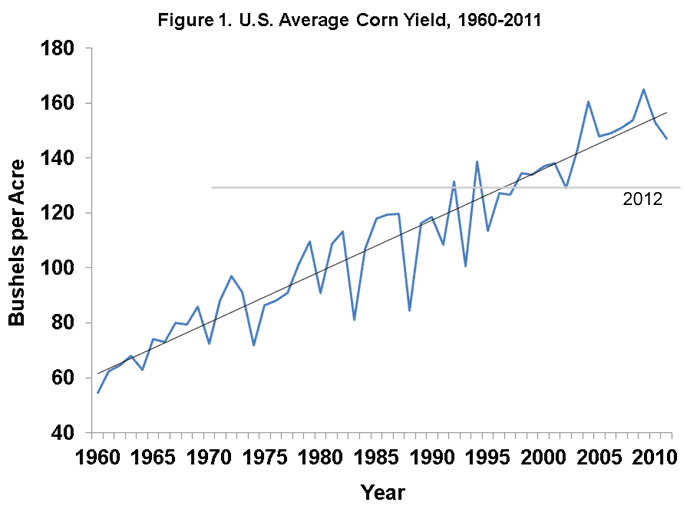 Even at this lower number, US yields will be more than twice the corn yield per acre in the rest of the world. Disasters are relative, I suppose, but this is a long way from the 1930's. But even though many markets have started accepting food stamps, critics still charge that they are only affordable for the haves, who are much more likely to have access to other fresh foods. A new report from the Union of Concerned Scientists puts some holes in that theory. It says that modest public funding for a couple hundred otherwise-unsuccessful farmers markets could generate to 13,500 jobs over a five-year period. I really do not have much time, so we will have to leave aside how government-forced reallocation of capital from current productive uses to subsidizing small and failing farmers markets will be a net source of employment. I have another point - as it turns out, we already have highly efficient farmers markets that source produce from the world's agricultural regions best suited to a particular crop and bring them in a very efficient and low-cost way to consumers, taking advantage of scale economies where they exist. They are called "supermarkets." If you want crops that don't take advantage of our best chemical and genetic technology, that are grown locally rather than in optimal soils and climates, and are retailed in inefficient, undersized and often unprofessionally managed part-time markets, they are going to cost more. As is typical, this has nothing to do with helping the poor. This is about government subsidy of a particular set of lifestyle choices of aging middle class hipsters. Cotton Growing Dying in Phoenix -- Good! Lavis, vice president of the Arizona Cotton Growers Association. "I wish we could grow more and the prices were better," Lavis said. Cotton averages 55 cents per pound, up from five years ago, Lavis said. But it costs 75 cents a pound to produce, he said. growers may say, 'Gee, I need to grow something else.' "
You mean at some point when prices are 20 cents under the cost of production, farmers might eventually consider planting something else? Duh. Farmers, generally rational sorts, would have made this decision long ago if it weren't for the enormous federal subsidies mentioned in the last paragraph that keep cotton profitable. And this underestimates the total subsidy, since farmers in Arizona (as well as Southern California) use millions of gallons of subsidized water, ofter priced below cost, usually priced below what we other citizens pay, and always priced below what a true market clearing price would be (which explains why Lake Powell is drying up). In this post I list information on cotton subsidies -- over $100 million in Arizona just for cotton in 2003, and 2006 appears to be a worse year. And notice the top three subsidy recipients are all Indian Tribes with very, very profitable casino operations. These are not struggling family farms. Most every one of these farmers on the top subsidy list are in cities (Goodyear & Queen Creek for example) that are right at the wavefront of Phoenix expansion and so probably sit on a fortune in real estate. I am sure they are happy to have the USDA pay them a half million dollars a year so they can cover the carrying cost of their land until they find the right developer to buy it for millions. Category: Government | Comments Off on Cotton Growing Dying in Phoenix -- Good!